Comments: I often note the blue topsnail throughout nortwest waters, especially in the Cape Flattery area. 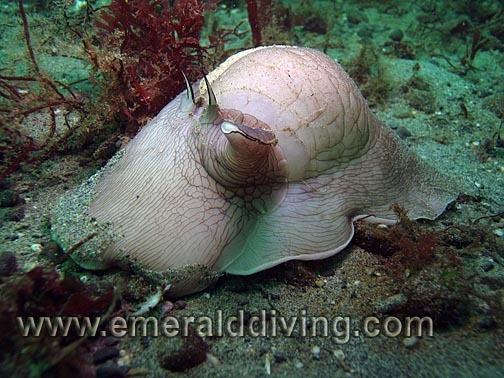 This abundant snail is known to feed on sponges and other invertebrates. 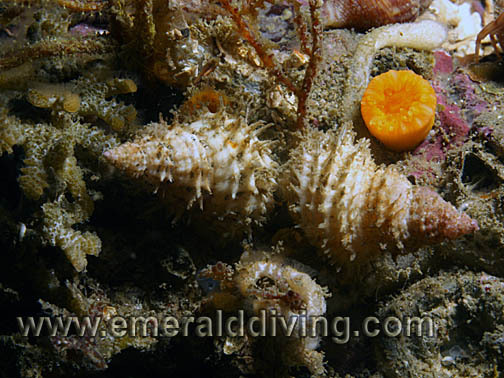 It is pictured here on a yellow encrusting sponge. Dinner time! 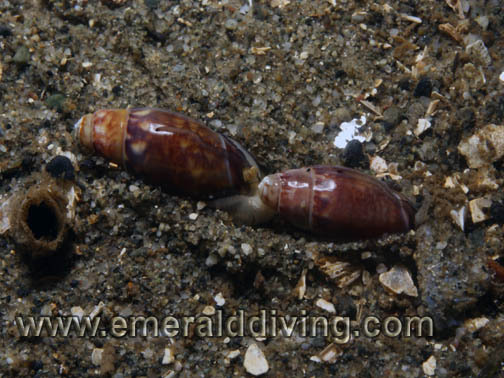 ID: White foot with brown mottling or blotching, light colored shell. Comment: A miniature version of the Lewis's moonsnail, the Aleutian moonsnail tends to sport some mottling or brown spots on its soft body. Photographed at Sunrise Beach in southern Puget Sound. ID: Three distinctive curved blades. 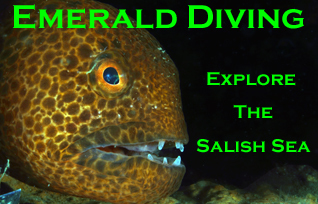 Comment: The leafy hornmouth is a common frequenter of reefs throughout Washington, especially Puget Sound. This snail is known to feed on banacles and bi-valves. The leafy hornmouth lays almost artistic-looking masses of square yellow egg cases in a spiral pattern during winter months. ID: Redish-brown elongated shell with 5 or 6 holes. 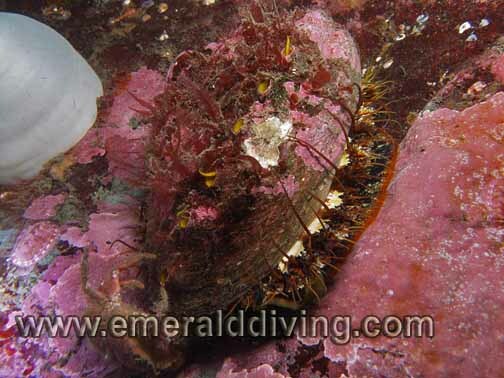 Comments: Once abundant in Northwest waters, the overharvested northern abalone is now rarely encountered when diving. I won't tell anyone where I found these specimens as I am certain some short-sighted diver would harvesting them too. ID: White shell with rows of hairs that spiral the shell. 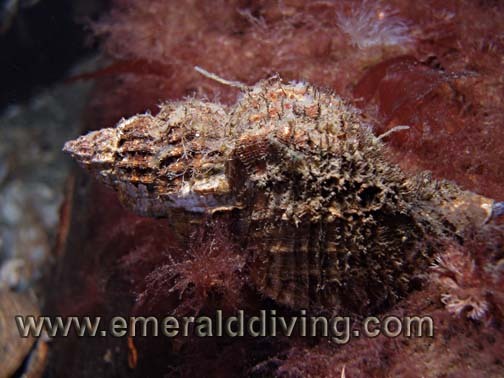 Comments: The Oregon triton appears to be very at home in Washington waters as I often note this robust-looking snail on most reefs. The shell of this snail has a hariy appearance. Often seen laying colonies of yellow eggs on rocks in congregations. 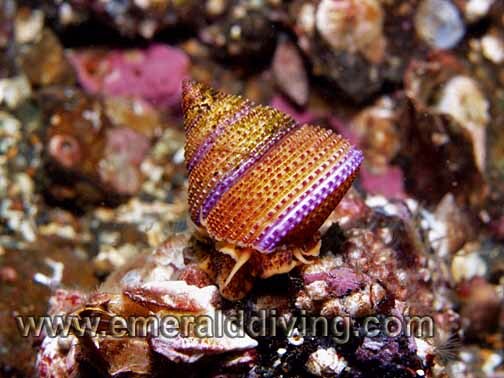 ID: Purple and gold banded shell. Animal;s fot is orange with brown. 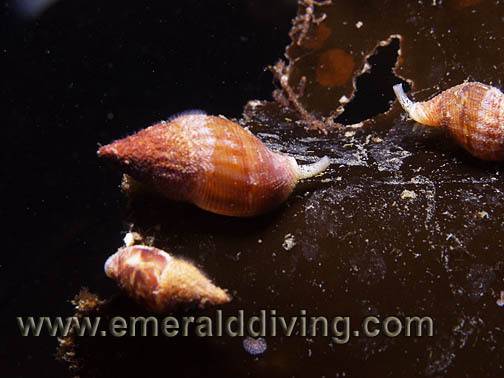 Comments: The beautiful purple ringtop snail is a favorite subject of many Northwest photographers with it striking colors and the fact the it can't swim away. 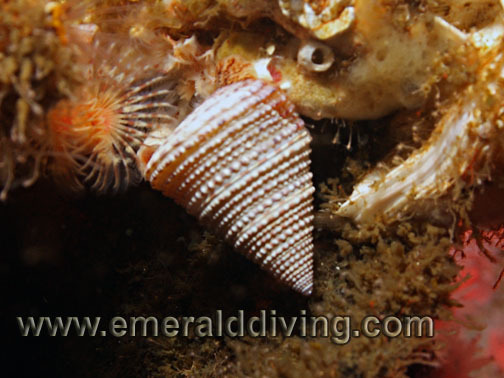 I only note the purple ringtop inhabiting rocky reef areas with good current flow in the Cape Flattery area. ID: Banded mantle and bright orange margin around foot. 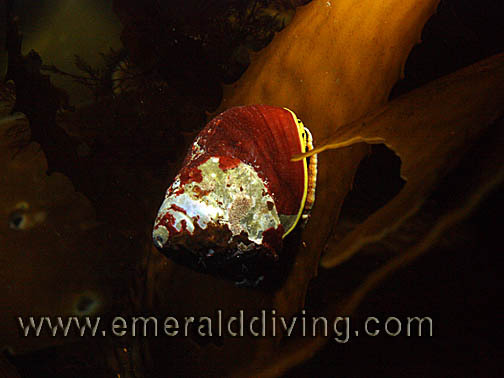 Comments: I have only noted this small yet distinctive snail when diving the Cape Flattery area. This specimen was found at Mushroom Rock on about 40 feet of water. ID: Multishaded shell with small "hairs" on part of shell, small size. Comments: This picture is a bit of a guess, but I believe these are wrinkled amphissa. I note this or similar species throughout Washington waters. Photo taken at Mushroom Rock at Cape Falttery. ID: Wide foot. Large shell, usually white. Open "tube" (umbilicus). 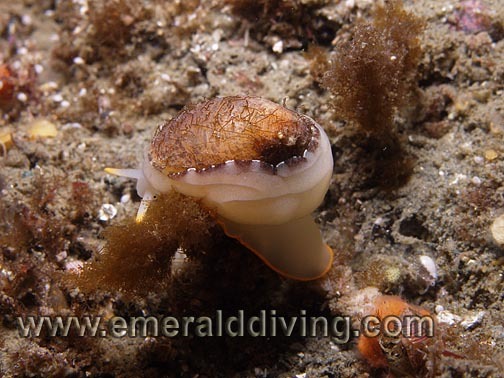 Retractable "horns" (operculum) lined in brown. No blotches on body. Comment: This huge snail is responsible for laying eggs in "sand collars", which look like round discarded plastic collars. 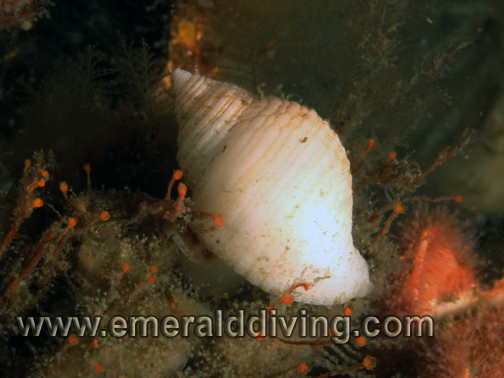 This snaill plws through sands substrates and feeds on clams. 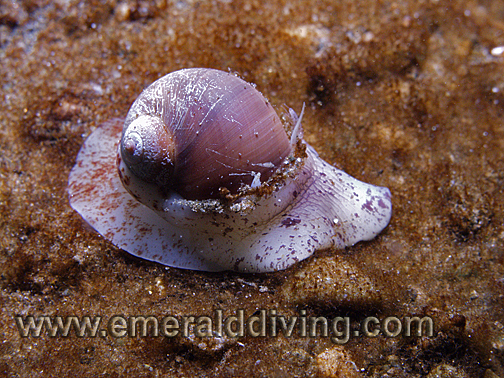 The dentition of the moonsnail can drill through hard clan shells. Photo taken at Sunrise Beach, South Puget Sound. ID: Off-white shell with brown circular markings. Animal's foot is white with brown markings. 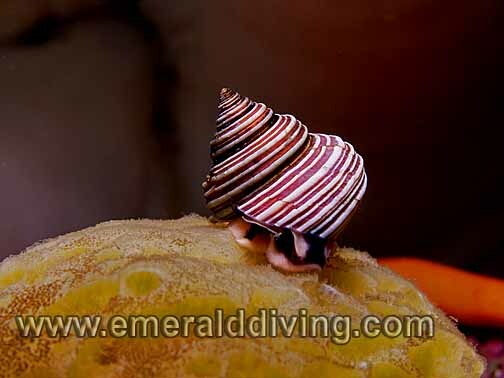 Comments: I have only seen this snail when diving the waters of British Columbia, although it ranges to Mexico. Feeds on hydrocoral and bryozoans. Photographed in Esperanza Inlet on the west side of Vancouver Island. Comment: I am not certain if these two baetic olives are in love or fighting, but they are making tracks in the sand together at Three Tree Point in about 100 feet of water. The shells of these and other similar olive snails were highly prized by Native Americans. ID: Distincitve shell with bristles that radiate inthe same direction. Comments: I have to look hard for these little snails in order to find them - and when I do find them it is in close proximity to tube worms. Photographed in Browning Pass, BC. ID: Smooth shell encrusted with red-brown. Comments: I note this snaill often in exposed areas, and usually shallow. I usually find it on rocks or kelp, as pictured here. Photograpphed at Hunt Rock, BC. 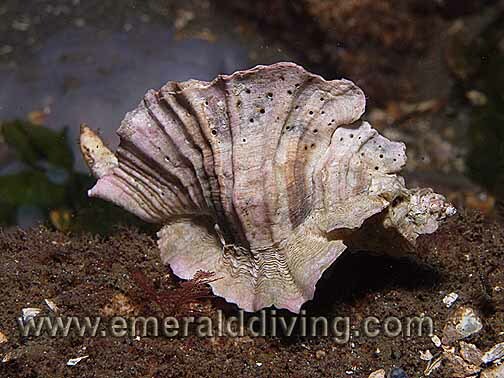 ID: Frilled shell, but frill sizes can vary. Color from white to brown, sometimes banded. Comments: I only occasionally note the ornate looking frilled dogwinkle. I more often find brown variations of this species. 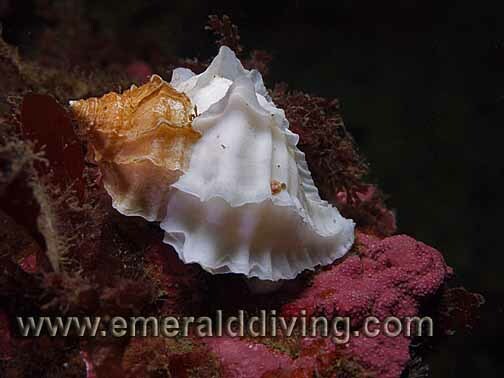 The picture of this frilled dogwinkle was taken above Dalco Wall in Puget Sound. Comments: Another of the small snails that often goes unnoticed. This one got noticed at Pile Point off San Juan Island. The depth of the channeling in the shell can vary.